This is a stock replacement up pipe for 86-7 Turbo Regals. 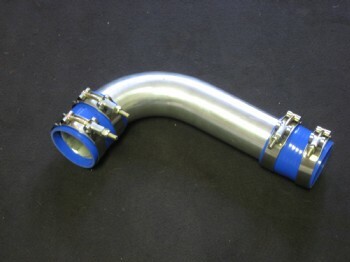 This item is a great upgrade from the factory steel throttle body up pipe. It is a raw finish 2.5" aluminum pipe and also comes with (2) 2.5 hoses and (4) Heavy duty t clamps as pictured. Ends are roll beaded. Hoses also available in black, select from drop down menu in the order box below. Straight 2.5" hoses are sent unless notified that you need reducer couplers. These are meant to fit with stock intercoolers and the stretch stock location intercoolers we sell. Pipe is easily polished with a good aluminum polish. 2.5 Inch Up Pipes $105 Hoses and clamps included.